Struggling with being on camera? Here’s how to practice. For most of us, it’s not a normal thing to record ourselves and talk to a camera. But with a bit of consistent practice, we can take one step toward making it feel at least a little less weird and maybe even have some fun with it, too. Think of 1 or 2 people who you enjoy watching videos of online. They might be YouTubers, a main stream celebrity or maybe even another blogger. The key here is not that you like how their videos themselves are MADE (that’s a whole other topic), but that you like how the person BEHAVES on camera. Maybe it’s their personality, charisma, confidence or sense of humor. Now, go search on YouTube for videos of them talking to camera, and watch them. Go deep here. Take 30 minutes or more to really dig deeply into their video content. Be a viewer and enjoy their content. Occasionally take note of how they approach sharing something to the camera, and what it is about their camera presence that you like and feel that you’re responding to (as a viewer). Are there certain phrases that they frequently use? Write those down. And if it helps you, try saying them aloud to yourself. Just play with it. Remember that this is just practice. Why does this method of imitation and practice work? It allows you to begin by modeling someone else’s approach on camera, instead of starting from scratch. For me, I was drawn to Joseph Gordon-Levitt’s and Mike Rowe’s approaches to their presence in their videos. I think the key is to find a couple people who you yourself find charming on camera. Practice talking to a lens. Record yourself with your smartphone or webcam. Not sure what to say? Share a favorite recipe with a friend who you know would love it, or share what your workspace is like with a family member who hasn’t visited you at work yet. Pick something, record it and share it with just one person. With this action step, my whole goal for you is this: To normalize that lens, for you to talk to the lens as if it’s a friend of yours. This is what’ll lead to you connecting with your viewers through that lens while they’re watching your videos. They’ll feel like they’re right there with you. 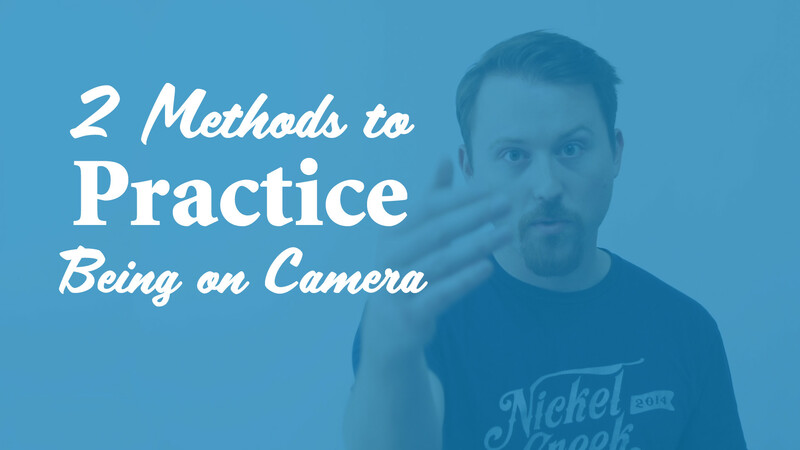 Let me know in the comments – whose approach on camera to you like? Who are you planning on emulating? I hope this has been helpful. Thanks for watching!